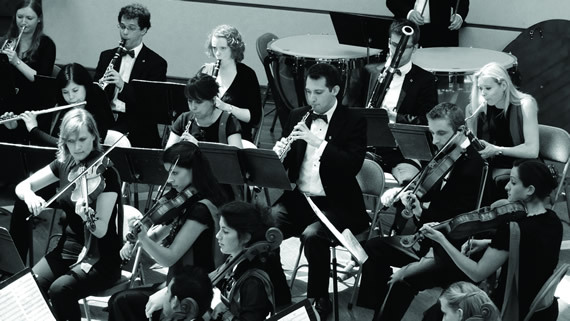 True to the motto “27 countries – one language (music)” the European Union Youth Orchestra (EUYO) toured the United States. Fifteen talented young American musicians joined the 140 European members for concerts in Chapel Hill, NC, Washington, D.C., New York City, Boston, MA and Bloomington, IN. At each concert the young musicians received standing ovations for their outstanding and expressive playing and for their obvious passion for music. The EUYO, which is at home in Bolzano, was founded in1976 by Lionel and Joy Bryer in Italy. The orchestra represents the European ideal of a community working together to achieve peace, social and cultural understanding. It brings together young, talented musicians from all 27 EU member states and performs under some of the world’s most famous conductors. To become a member, 14 to 24 year-olds can take part in the auditions held in each EUmember state. Once a member of the orchestra, the young musicians have to re-audition every year to keep their respective places. The EUYO offers the aspiring musicians the opportunity to train with the best and to experience performing on international stages. More than 90 per cent of the EUYO members plan to later become professional musicians. On April 15 and 16, the European Union National Institutes for Culture in Washington, D.C. invited the EUYO to hold concerts at the Kennedy Center and the Embassy of Austria. Prior to the concert at the Embassy, the musicians took part in an outreach program at three schools in Maryland (Montgomery Blair High School, Thomas S. Wootton High School, and Bethesda Chevy Chase High School). Austrian Ambassador Dr. Hans Peter Manz welcomed the young musicians and emphasized the EUYO’s exceptional accomplishments both as a chamber music ensemble and as a full symphony, as well as in their roles as individual soloists. Cecilia Porter, classical music critic of the Washington Post, praised the young musicians for their virtuosity and energized way of playing.